For many, the first sighting of The Great Pumpkin or Jamie Lee Curtis running from a knife wielding, masked murderer heralds our full thrust into the Halloween Season. But, for many (and many devoted Disney animation fans), the sight of Mickey Mouse “bustin ghosts” and Huey, Dewey and Louie Trick or Treating is a better association with the Pumpkin Spice Season. Two classic Disney cartoon short subjects that have become associated with Halloween, both celebrate anniversaries this year, which seems the perfect time to celebrate both of them. Lonesome Ghosts, which debuted on December 24, 1937, marks its 80th anniversary this year. Hitting theaters just three days after Walt Disney’s groundbreaking, first full-length animated feature film, “Snow White and the Seven Dwarfs,” “Lonesome Ghosts” was a co-starring vehicle for Mickey, Donald Duck and Goofy. As the short opens, we see a dilapidated house, where inside three bored Ghosts (designed with full, ’30’s cartoony flair – complete with bowler hats and bulbous noses) decide to have some fun and feigning a female voice, they call the Ajax Ghost Exterminating company. The three “exterminators” answer the call and quickly make their way to the house, where of course, our favorite Mouse, Duck and Whatever-Goofy-Is, are tortured by the Ghosts (don’t worry-spoiler alert!- the specters get theirs in the end). Directed by Burt Gillett, a veteran of Disney shorts and featuring animation by such legends as Clyde Geronimo and Art Babbitt. It’s evident from the creativity used that “Lonesome Ghosts” was crafted by this creative mindtrust. What is particularly ingenious are the slapstick scenes in which Goofy becomes entangled in a dresser. Through the years, “Lonesome Ghosts” was also a staple of Disney TV Halloween specials and Halloween episodes of the Disney TV series, such as 1977’s “Halloween Hall of Fame” and “Disney’s Halloween Treat” (1982) which featured a compilation of spooky shorts and clips from features. Released on October 10, 1952, just in time for the season, this classic short celebrates 65 years this month. A perfectly crafted starring vehicle for Donald Duck, “Trick or Treat” centers on the “foul fowl,” who decides to play a trick, instead of providing treats to his nephews Hewey, Dewey and Louie, when the three innocents appear on his front door step on Halloween night. When a witch – Witch Hazel to be exact – spots the boys while out traveling on her broom, Beelzebub, she takes pity on them and agrees to help. Through Hazel’s witchcraft, Donald winds up emptying his entire pantry of candy. Directed by Jack Hannah, a veteran of numerous Donald Duck short subjects, “Trick or Treat” works perfectly, as not only a solid comedy short, but also captures the Halloween season. One of the film’s highlights is the character of Witch Hazel. A character so full of personality, its a shame that she never appeared in another Disney Short. Voiced by the one-and-only June Foray, the incredibly dynamic voice actress who just recently passed away in July, Hazel was the perfect “anti-heroine” and a terrific foil for Donald. In an ironic twist, June would provide the voice for Witch Hazel again…later at Warner Bros. and for MGM! The home of Looney Tunes introduced their own character of Witch Hazel (with a completely different character design and voiced at first by Bea Benaderet), in “Bewitched Bunny” (1954). Witch Hazel (voiced by June) would appear again in Hanna Barbera’s Tom & Jerry cartoon The Flying Sorceress and Warner Bros. Broomstick Bunny (both 1956). In addition to the Disney version of Witch Hazel, “Trick or Treat” also features a number of Halloween traditions that, through the beautiful, full animation that is the Studio’s Hallmark, truly bring the Season to life. There’s a full moon, a black cat, traditional costumes and, once again, cartoony Ghosts, who, with the voices of the popular singing group, The Mellowmen, sing the short’s catchy, title song (good luck getting that “ear worm” out of your mind after you’ve heard it). 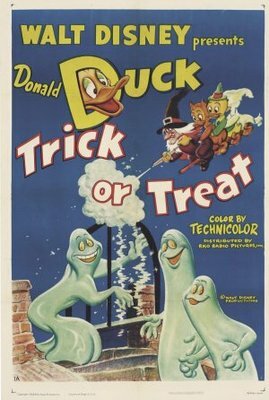 Long before 1993’s “The Nightmare Before Christmas, ” Donald’s Duck’s “Trick or Treat” was Disney’s main foray into Halloween. In addition to annual showings, there was also a Disneyland record album version of the short. And, proof of “Trick or Treat’s” lasting popularity can be seen in this season’s new Disney Channel special “The Scariest Story Ever: A Mickey Mouse Halloween Spooktacular.” In it, Huey, Dewey and Louie dress in the same costumes worn in the classic short. I remember that Disney came out with a collectible pin of Witch Hazel from Trick or Treat during the Halloween season one year and the now defunct Warner Bros Studio Store had a Witch Hazel bean bag doll also for the Halloween season. I’m a proud owner of the Witch Hazel pin and bean bag doll and for Halloween this year I place the Witch Hazel bean bag doll on the tv shelf in honor and loving memory of June Foray. Interestingly, both cartoon got comic adaptions of some sorts. 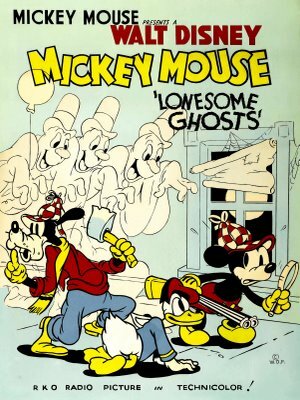 “Lonesome Ghosts” loosely inspired the Mickey Mouse storyline, “House of the Seven Haunts” where the ghosts were fake. Done by Floyd Gotterfredson, it was the last time he used Donald in the strip (the duck got his own comic by this time). “Trick or Treat” was adapted as a tie-in comic book story done by none other than Carl Barks. 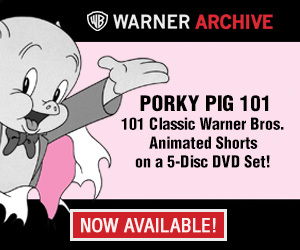 He originally added some new scenes not in the cartoon (including a derby wearing monster), but the publishers thought it strayed too far from the short and were cut out before publishing. Years later, when the story was re-printed, the scenes were restored(including a recent Fantagraphic collection). Witch Hazel herself later appeared in other comics including a story with Magica DeSpell and “The Sword and the Stone’s” Mad Madame Mimm that just got printed in the U.S. (probably partly as a tribute to June who voiced the former two) for the first time by IDW publishing. “Trick or Treat” is a standout Donald Duck short for many reasons. It has a well-crafted plot, a catchy title song, and some very clever detail touches–such as when the outraged Hazel’s hat and hair momentarily jump, revealing a bald head, or when Donald’s feet change color after being sprayed with the magic potion. It is one of the rare Disney short subjects that shares the kind of production values that went into the feature films. Most of the Duck cartoons of the period are a series of one-upmanships between Donald and whoever his antagonist is–the bee, the ant, Chip’n’Dale, etc. with actual plot or character development virtually non-existent. “Trick or Treat” is an anomaly–it’s one of the few seasonally themed shorts produced by the Disney studios and it also is one of the few Duck outings to have the look and feel of a feature. “Lonesome Ghosts” also has a well-defined plot, although it is much more gag-oriented and employs the formula of separating the protagonists for their own comedy bits before bringing them together for the finish. Still, the animation of the ghosts is extremely impressive. My favorite bit is the Mickey sequence when the ghosts pop up from a trap door in the floor, ride a boat over a wave of water that douses him when he opens a hall door, and so forth. Mickey’s face is very expressive, showing off the amazing ability of the animators to convey a variety of complex emotion at once. I also like the moment where Donald tries not to fall into a pool that has opened up in the floor, only to find it solid and then to find it is water again when the ghosts resurface. 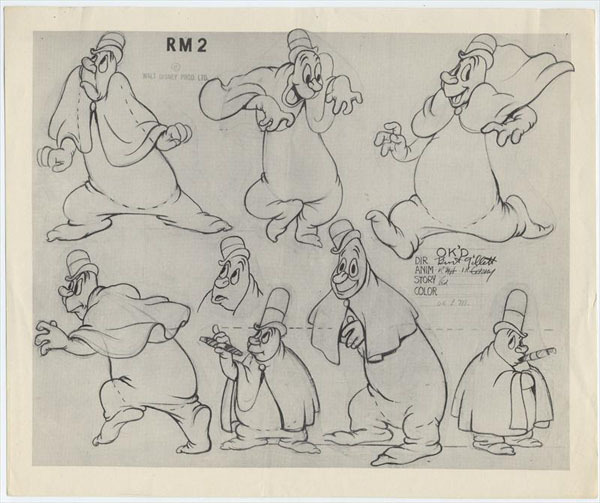 I believe Walt Kelly animated this sequence, as Donald’s design subtly resembles his unique drawing style. I could be wrong, but it looks like his work. Great post on my two favorite Disney Hallowe’en-type cartoons! Not just the bald pate, but when Hazel tastes the brew, the way her hair curls and uncurls! My favorite animated bit in this cartoon is when Donald’s dancing feet conk his head on the pots and pans – not just the timing with the music (which matches perfectly) but the way Donald is kept centered in the frame while the background moves side to side! I was watching Trick or Treat today for the first time ever on the Disney Treasures DVDs, and as soon as I heard the witch’s voice, I immediately thought that sounds just like June Foray and WB’s Witch Hazel. I never thought I would hear June doing voicework for Disney, since I strictly associated her with WB. And now I know! Great informative article! Trick or Treat and The Lonesome Ghosts are on my Top Twenty Disney Cartoons from 1927-1957. Michael Lyons is a freelance writer covering the animation industry.